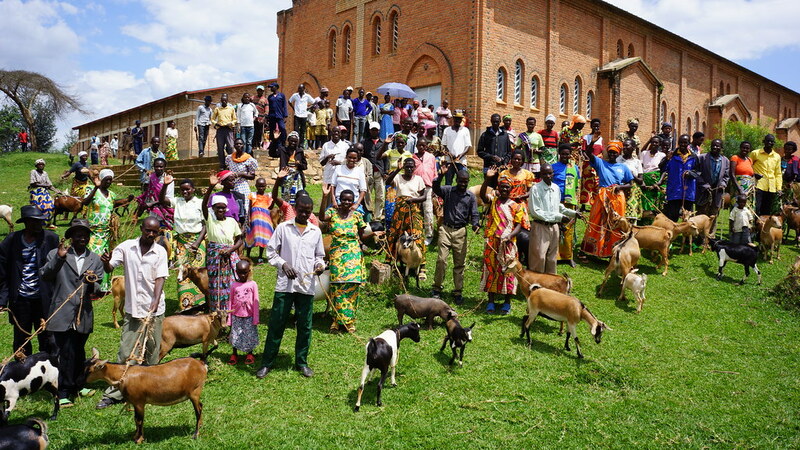 The Akanyaru Watershed Protection Project, an investment of Rwanda’s Fund for Environment and Climate Change, is boosting climate resilience and improving the livelihoods of residents in Gisagara District, Southern Province. At a “Kurasa ku Ntego” (hitting the target) event organised on 19 November 2015 by the Akanyaru Watershed Protection Project in partnership with Gisagara District, project members shared how their lives have improved thanks to the fund’s investment. The event shared achievements, livelihood improvements and discussed how the community can ensure the project's ongoing success and sustainability. The Akanyaru Watershed Protection Project was launched in October 2014 and has introduced a range of environmental protection measures to increase the climate resilience of the watershed. The main interventions include building terraces and planting trees to prevent soil erosion and landslides, which used to silt the Akanyaru River and its tributaries. Two 150 cubic metre tanks are being constructed near Nyaruteja market to harvest rainwater generated from the market, which currently floods the surrounding area. These interventions are enhancing the protection of the Akanyaru Watershed, controlling soil erosion and landslides in the area, as well as developing the community. “Thanks to the terraces established on our plots, the soil is no longer washed away and this has increased our agriculture production,” said Donacienne Ahishakiye, a mother of four children living in Kigembe Sector, Gisagara District. The project employs local residents to construct terraces and plant trees. This has increased community ownership as well as improved their livelihoods through the income they earn from working on the project. Speaking at the “Kurasa ku Ntego” event, the Vice Mayor in charge of Economic Affairs and Development in Gisagara District, Hesron Hategekimana, commended the work being done by the Akanyaru Watershed Protection Project to increase climate resilience in the area. He also urged Gisagara residents to ensure the project’s sustainability. “The terraces established through this project will lead to increased agricultural production. You should safeguard them to ensure food security in our district and those surrounding us,” Hesron said. Addressing Gisagara residents, the Green Fund’s District Facilitator, Alain Michel Doricyusa, expressed his appreciations to the community for their active participation in the project. He also applauded the district and project members for creating personal Imihigo (performance contracts), which are helping them to reach personal goals such as saving money and starting small businesses. Alain Michel encouraged the community to think about the future and sustainability of the project alongside the improvements in their livelihoods. The Gisagara Akanyaru Watershed Rehabilitation Project is one of nine district-led climate resilience investments made by Rwanda’s Fund for the Environment and Climate Change. The project directly supports more than 10,000 people through employment in conservation. The total investment by the Green Fund in the Akanyaru Watershed protection project is Rwf 2,125,218,594 or US $2.8m out of a total project budget of Rwf 2,591,729,992 or around US $3.5m. The remainder of the funding comes from Gisagara District.